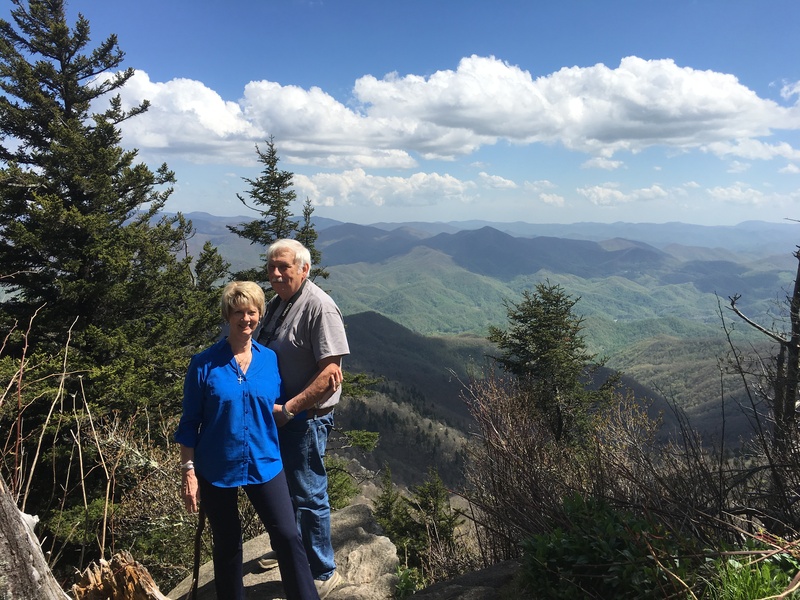 Trail’s End RV – Let's Go RVing! On Thursday the weather forecast for Saturday morning was a little iffy but Peggy scheduled the ride anyway and it turned out to be a perfect day. We had to be a Cataloochee Ranch by 9:15 for a ride beginning at 9:30. When we got there we realized there was 10-12 riders and Peggy remarked that she had never been on a ride with that many. We soon realized though that they were splitting up the groups so we ended up with only 5 in our group. Peggy had been before and knew the horse she wanted to ride and she got him. I ended up on Clyde a Tennessee Walking horse mix. Our lead guide was new having only been at Cataloochee one week so we also had another guide who brought up the rear. 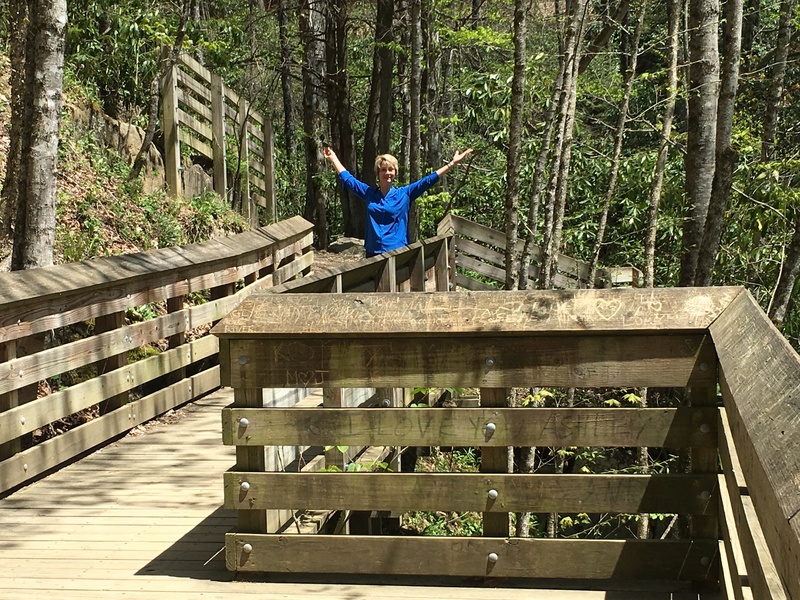 Our ride took us by Salamander Creek and is described on the website as “A leisurely ride down Wagon Trail to waterfall at Salamander Creek, then up through shaded forest to open vistas of the Big Bowl and past the chestnut orchard”. That is a perfect description as we wound up, down and around to the valley. At one point we stopped, got off and let the horses rest and drink water. On two other occasions we stopped at watering troughs for the horse to drink of the fresh cool stream water. Towards the end of the two and half hour ride we “trotted” a bit. Clyde started off doing a pacey running walk and then began to do a weird trot. I thought I would be posting on any trotting but in that western saddle and that weird trot posting was not an option. 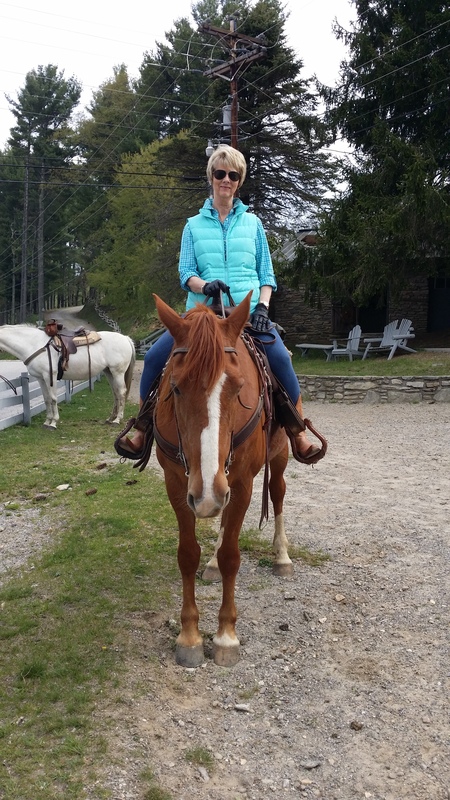 I was afraid I’d be sore since I haven’t ridden in a while and 2 ½ hours in a saddle is a long time but I was fine except for my right ankle. Although it’s been several years since I broke it and tore the tendons it still gives me trouble occasionally. When it began to hurt I just dropped my stirrup and let me foot hang and that eased it. Two times we went through a natural arbor full of rhododendron and as beautiful as it was I can just imagine it when the flowers are in full bloom. It was a great morning, perfect weather, good horse and good company. 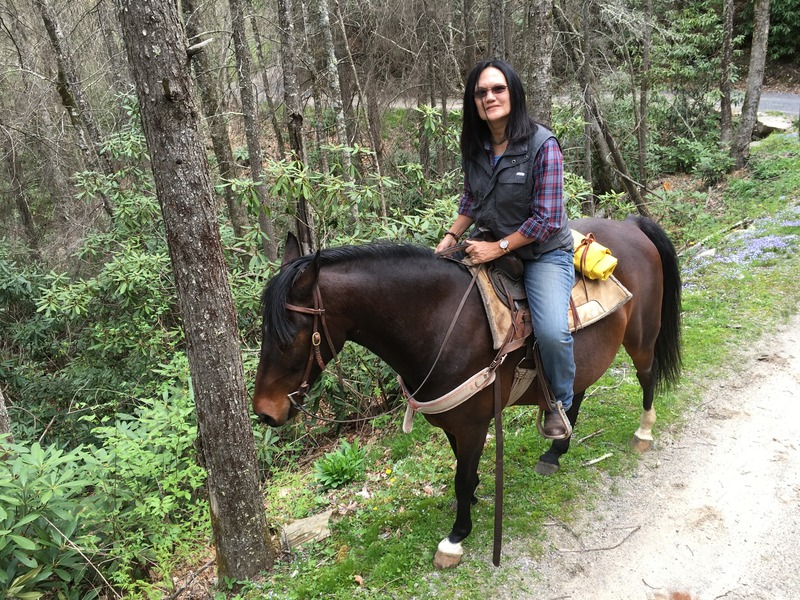 I highly recommend Cataloochee Ranch for rides. I have taken too other trail rides in the past and this was by far the best. It lasted longer, let us to something besides walk plus we saw beautiful scenes. When I got back to the RV Jerry had washed the car and vacuumed the coach plus gone to Walmart to get some necessities including the hair dryer we forgot to get Thursday. After I ate lunch I asked Jerry what he wanted to do for the afternoon and he pleased me with his response – “Nothing”. I think 2 days of hiking and a half day in the saddle had worn me out. In fact I think we both needed a little rest. I sat outside for about 15 minutes then headed inside to the bed for a nice nap. Peggy and Tony had invited us out for dinner at an Italian restaurant named Frankies so a little after 5:00 we headed there. Three of their friends joined us and we had a delightful dinner. Afterward Peggy and Tony and Jerry and I joined by Charlie, one of the friends at dinner headed over to the Dairy Queen for ice cream. Although I generally do not eat sugar or have caffeine after 4:00 because it will keep me awake I decided to chance it tonight and had a cone of chocolate ice cream. We had a delightful visit and Charlie, a retired Navy guy and retired US Marshall entertained us with some interesting tales. Peggy and I also chatted and got to know each other better. I do hope we get back to this campground one day and get so see them. Tony and Jerry found that they had a lot in common. When we got back to the campground it was nearly 10:00 so I got ready for bed. Caffeine and sugar didn’t seem to bother me a bit tonight as I slept like a baby!